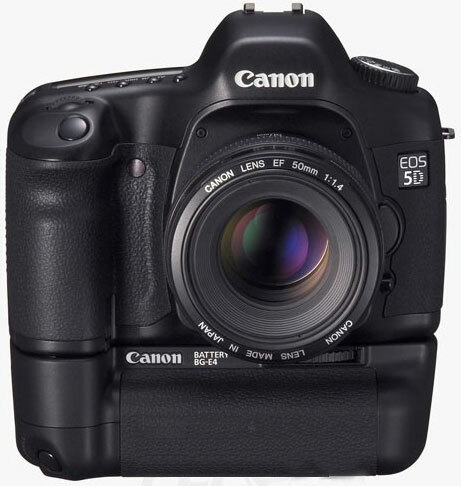 After numerous on-line product reviews and personal reports, and a few trips to Glazer's in Seattle, who have a great staff (ok, an additional hype for them), I bought a Canon 5D DSLR with the battery pack, just like the photo above, with the 50mm f1.4 lens. I also got four other lenses they had in stock, a 35mm f1.2, a 85mm f1.2 USM II, a 135mm f2, and a 180mm f3.5 macro. These do what I normally do with my film system. What no zoom lenses? Nope, I don't own any, anymore. I gave or sold all of mine years ago. I like fixed focal length lenses, they make me think about composition because it's all about where I stand and see. That's another discussion, but suffice to say after using several I used them either at the extremes, which are common focal lengths, or at traditional focal lengths in between the extremes. Why not a single zoom to cover several fixed focal length lenses? Three reasons. First, speed, few zooms are as fast as equivalent fixed focal length lenses, and faster apertures mean brighter few viewfinder for focusing. And faster apertures afford you faster shutter speeds or working in lower light conditions, even 2-3 f-stops faster. Second, unless you buy a highend zoom lens, zooms don't really touch fixed focal length lenses for quality. Argue all you will if the difference is small for most uses, and you're right, but it's gets down to the last reason. Three, you use what works best for you. Simple put if I don't like using them, so be it. And it is my money. Did you forget? It won't make me necessarily a better photographer, that comes from talent, experience and knowledge to produce results, but it will make me more comfortable with the equipment, and that's the key. The equipment has to be second nature to the photographer, In your hands and in your mind. So, is there any real difference? Like that's a smart question.